Help Your Dog Be Healthier, Happier and Free of Pain Without Spending a Fortune or Your Money Back! With our all natural Hip&Joint Supplement you can now easily help you dog live a healthy and pain free life he or she deserves! With its highly effective ingredients Pointpet soft chews are easy to administer, have a great taste and will promote healthy joints, improve mobility, ease discomfort from arthritis or hip displaysia and help achieve overall health and vitality! Supplements to the dog's diet, such as Glucosamine and Chondroitin Sulfate, Omega Fatty Acids, Vitamin E, MSM (Methylsulfonylmethane), Yucca Schidigera, Turmeric and Curcumin all assist in decreasing inflammation and improving the body's ability to repair and strengthen tissues. To make our Advanced Hip & Joint supplement even more efficient we added Sunflower Lecithin which is considered beneficial to the brain and nervous system, helps to process fats and to support cell membranes. We also included Organic Black Pepper to increase the benefits of Curcumin. Even though we cannot turn back the clock for our pets, glucosamine is a safe and natural way to help improve your dog's joint function and quality of life. Many pet parents are surprised at the improvement they see in their dog's activity level after starting a joint supplement. 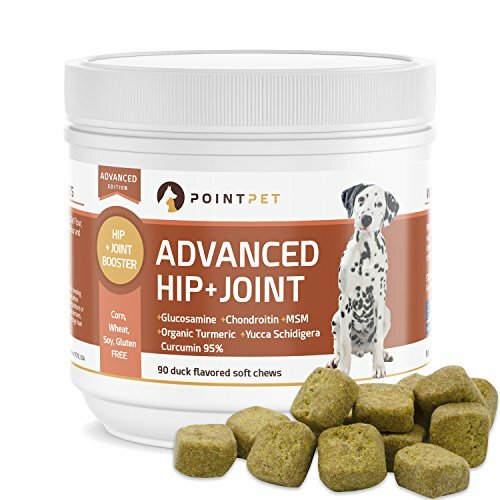 Have a Healthy, Happy, More Energetic and Active Dog in Just a Few weeks Time by Ordering Pointpet Hip and Joint Supplement NOW. We guarantee your dog will benefit from it otherwise we will refund you every penny. RELIEVES JOINT PAIN & IMPROVES MOBILITY - Increase your dog's energy levels and reduce arthritis pain. Glucosamine, Chondroitin, and MSM support joint lubrication and normal cartilage function. Promotes healthy joints, improves mobility and ease discomfort and pain. Great for dogs with painful joint conditions like canine arthritis and hip dysplasia. It may help reduce the needs for NSAID's. SUPERIOR FORMULA WITH THE MOST ACTIVES PER ONE CHEW - 400mg Glucosamine HCL, 100 mgs Chondroitin Sulfate, 150 mgs MSM, 120 mgs Sunflower Lecithin, 100 mgs Organic Turmeric 95% with added Curcumin, Organic Black Pepper, vitamin C&E, Omega 3&6 Fatty Acids and Yucca Schidigera powder for extra health benefits. You get more milligrams of the important nutrients in each chew, so you can give less for the same dose and save money! Trusted and Recommended By Veterinarians. SAFE, ALL NATURAL INGREDIENTS - No preservatives, sugars, filler, grains, corn, wheat, gluten or by-products. Recommended by veterinarians and is excellent for active or senior dogs. Organic Turmeric has shown to be a powerful antioxidant and anti-inflammatory as well as aiding in digestion and minor digestive disturbances, promoting general wellbeing and helping the healing process of minor skin irritations in dogs. 90 SOFT CHEWABLE TREATS YOUR DOG WILL LOVE - Our natural duck flavored chews may help alleviate the discomfort associated with normal, daily exercise and activity, help maintain flexibility and normal, comfortable motion, Natural Ingredients are beneficial for a better supplement absorption. The quality you can trust! All around Canine Joint Support. SAFE for dogs of all ages. MADE IN THE USA in FDA, USDA and FSIS regulated manufacturing facility. HAPPY AND HEALTHY DOGS or 30-DAY 100% MONEY BACK GUARANTEE - Return even the empty bottles! We're so confident that your dog will love and benefit from PointPet Advanced Hip & Joint Supplement that we'll refund every penny if your dog does not like it! What do you have to lose? Save your time and money and purchase 2 bottles to get 10% off now! If you have any questions about this product by POINTPET, contact us by completing and submitting the form below. If you are looking for a specif part number, please include it with your message.